Google’s review process of the domain, mystagingwebsite.com is complete. Google systems indicate the domain no longer contains links to harmful sites or downloads. Removal of warnings visible to users will be complete within the next few hours. If you have any questions feel free to reach out to support. We believe we’ve isolated the issue and have requested our domain be cleared. We will update you as soon as we have confirmed that the domain has been cleared. We are continuing to work toward a solution for this issue. We have identified potential causes and are working on resolution so that we can have this warning cleared. We will update again as soon as we have more information available. 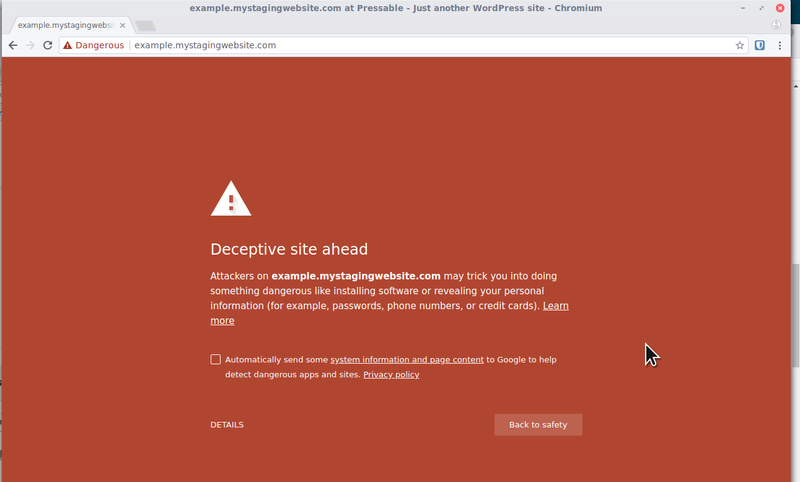 We have recently learned that some staging sites found on the domain mystagingwebsite.com are reported as containing deceptive by Google Chrome and some Chromium-based browsers. Our engineering teams are actively evaluating our servers and reaching out to Google to get the notice removed as quickly as possible. We’ll update this status post with further information as it becomes available. What to do if you see this warning? If you’re given the, No unsafe content found message it is safe to view your staging site. To view your site click on the word Details. Then click on the visit this unsafe site link. In some cases, you may need to click the link twice. In the event that Google’s Transparency Report tool reports unsafe content on your site, please reach out to our support team at help@pressable.com or start a live chat with us. Is there anything I can do to hide or suppress this notice? For help adding a domain reach out to our support team. This entry was posted in Uncategorized on June 15, 2018 by Brooke..